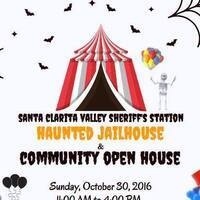 Santa Clarita Valley Sheriff's Station is hosting their annual Haunted Jailhouse. A $2 donation per person to the SCV Boys & Girls Club at the entrance is requested to enter. There will be a Jailhouse Tour, Entertainment, Petting Zoo, Game Booths, Food Trucks, and Sheriff's Department Displays. Costume Judging: Under 2 at 12:30 pm, ages 2-4 at 1 pm, ages 5-7 at 1:30 pm, ages 8-10 at 2 pm, ages 11-12 at 2:30 pm, 13- Adult at 3:00 pm.